After the 2nd symphony of Brahms and Fauré's Requiem, European musicians change their style and period. The silent cinema with musical accompaniment had its hour of glory until the 1920s. Charlie Chaplin with his famous Charlot was a worldwide success. With the arrival of the talking film, the "mute" gradually lost its notoriety. But fashion effects are ephemeral; the beauty remains. Music speaks to the heart as well or better than the Word. 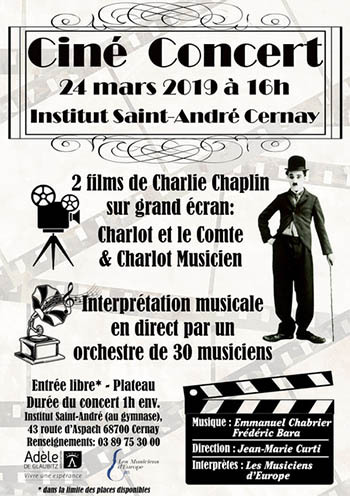 and "The Vagabond" on Emmanuel Chabrier's music chosen by Frédéric Bara: Excerpts from L'étoile, Bourréefantastique, Idylle, Uneéducation missed, Ouverture de Gwendoline, Happy walk, The king in spite of himself. The show lasts about one hour and will be accompanied by comments. Free entrance with tray. We hope to see you, in Alsace or Haute-Savoie. 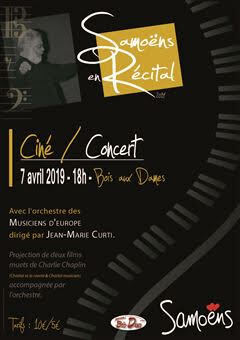 Let yourself be carried away by the poetry of the Ciné-Concert. © Les Musiciens d'Europe 2018 - 2019. All rights reserved.